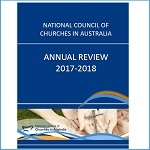 At the Annual General Meeting on 30 October 2018, The Interim General Secretary presented an Annual Review for 2017-2018 relating to the activities and programs of the National Council of Churches in Australia. The NCCA pdf Annual Review 2017 2018 (3.86 MB) can be downloaded here for your information and interest. The audited NCCA Financial Statements 2017-2018 were also presented at the Annual General Meeting and these are available to member churches on request.